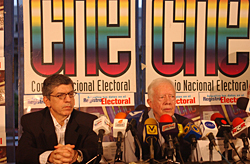 Former U.S. President Jimmy Carter led a team of international observers from The Carter Center during the Aug. 15 presidential recall referendum in Venezuela, when citizens voted on the recall of President Hugo Chavez. 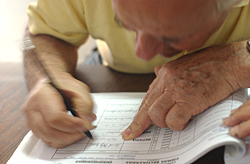 The Center previously observed the reparos--or signature verification correction periods; the signature collection; and the signature verification process. On Aug. 27, Venezuelan electoral authorities confirmed President Hugo Chavez's victory in the referendum. Though there were accusations of fraud by the opposition, the final official results totaled 59.25 percent for Chavez, 40.74 percent against. The Carter Center participated in an audit of the votes (see final report above) and concluded the results were accurate. This Web feature examines developments leading to the current crisis in Venezuela, and the Carter Center's crucial role since 2002 in finding a resolution to the situation. Note: This Q&A was originally posted May 22, 2004, and reflects the situation in Venezuela at that time. Can you give some background on President Chavez and the current crisis in Venezuela? Venezuela is on the northern coast of South America and is one of the primary sources of oil to the United States. It had been a fairly stable, established democracy since 1958, but in the 1990s, growing poverty and plummeting confidence in the traditional political parties led to the election of Lt. Col. Hugo Chavez as president in 1998. He led an attempted coup six years before against the elected president at that time, failed, was jailed, and later pardoned. He then came back, formed a political party, and was elected president in 1998, which The Carter Center observed. Despite early approval ratings exceeding 80 percent, his leadership style was confrontational, and the country became extremely divided and polarized, culminating in an attempted coup against him in April 2002. He was removed from office by the military, until the military reversed course under pressure from other Latin leaders and from the people on the street, and put him back in office two days later. How did The Carter Center become involved in Venezuela? 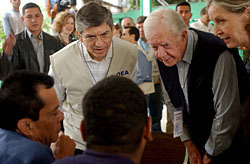 After the April 2002 coup, President Chavez asked former President Carter to help him establish a dialogue with the opposition. President Carter had traveled several times to Venezuela, including monitoring the 1998 and 2000 elections, and he and President Chavez built a very good personal relationship. As a result of this invitation, Carter Center staff started going to Venezuela frequently. The Center established an unprecedented relationship with two international organizations--the United Nations Development Programme and the Organization of American States--in a tripartite working group to lead a national dialogue. What was the outcome of the national dialogue? That national dialogue took place over several months and resulted in an agreement in May 2003. The two sides agreed that the constitutional provision for a recall referendum on the president could help resolve the deep divisions and questions about the president's mandate. In the United States, we have the possibility of recall in some cases at the state level--you remember the gubernatorial recall referendum in California. In the new constitution passed in 1999, Venezuelans put in this unprecedented provision for a recall on the president and every other elected official, which could happen halfway through their terms. So, both sides recognized that provision could be enacted if the opposition wanted to gather the required signatures. The first thing they had to do to carry this out was to have an electoral agency in place. Because of the divisions that also affected the legislature (National Assembly), the National Assembly had not been able to agree on the appointment of the five-member board for the National Electoral Council. The Supreme Court had to step in and name this board: although formally an independent and nonpartisan agency, two members were seen to be government sympathizers, and two were seen as opposition sympathizers. The fifth was to provide a neutral balance. However, as it has turned out, we have seen a fairly regular pattern with three members voting together against two others on those occasions with a divided vote. How is The Carter Center involved in the recall effort? Because The Carter Center and the OAS had been working as facilitators and mediators, the electoral board asked both--the two organizations with election experience--to monitor the recall effort. We've never observed a recall referendum before, so this is a new process for us. It also has been a new process for Venezuela, and it's been quite a learning experience all around. This is a recall on the president of the country, so obviously the stakes are very high. We're talking about the struggle over the use of oil revenues and resources, and over how to address the country's poverty. When I was in Venezuela for the petition signing, I visited a barrio and was shown some of the programs that low-income Venezuelans are very proud of. They are happy that the Chavez government has provided clinics, using Cuban doctors; supermarkets offer subsidized food; there are literacy programs and adult education programs. So, many of the people inthe barrios are very happy with these programs they are receiving, in some cases for the very first time. However, others in Venezuela are concerned that checks and balances are being weakened, and that President Chavez' "Bolivarian Revolution" and his close friendship with Fidel Castro is leading the country down the path toward another Cuba. These two different perspectives have created the deep divisions. Q&A With Jennifer McCoy: Is Democracy Backsliding in Latin America? President Carter meets with reparo officials during the signature verification process. Venezuelan citizens verified the authenticity of their signatures in the original petition calling for a recall referendum. 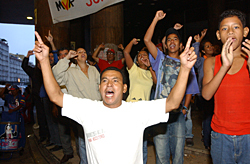 The emotion displayed at a rally during the reparos underscores the bitter political divisions in Venezuela. A member of the Carter Center observation team interviews an election official. Secretary General César Gaviria of the Organization of American States (left) and President Carter hold a press conference prior to the May 28-30 reparos. 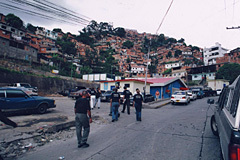 Many low-income Venezuelans living in barrios (above) report the creation of medical clinics, literacy programs, and supermarkets with subsidized food under the Chavez government.